In bulk material handling industries, like steel mill, cement plant, thermal power plant, mining etc ,different kinds of chutes can be found for conveying coal,cement,alumina,sinter dust and other aggregate materials from one transport unit to another. Chutes are flat plates, having relatively smooth transferring surface, arranged at different angles to transfer or guide materials along the chute under force of gravity. Many types of chutes exist,According to the force of the ore particles, they can be divided into gravity chutes and centrifugal chutes, If classified by the selected particle size,they can be divided into coarse chutes, ore chutes and slime chutes. It is important that a chute is designed correctly to ensure the efficient transfer of bulk solids without spillage and blockages and with minimum chute and belt wear. The importance is accentuated with a trend towards higher conveying speeds and ever increasing throughputs. Some common defects in the use of chutes, such as poor material flow, short service life, too much noise, large impact on downstream equipment, leakage, etc. need to be considered during chute structural design and material selection. 3.1.1 To protect the chute structure from abrasion,erosion, temperature imposed by the product. 3.1.2 To protect the product from damage by the chute due to chemical reaction or mechanical damage by the chute. 3.1.3 To increase or reduce friction or otherwise change the velocity of the product. 3.1.4 To process the product during transit along the chute. The selection guide for lining solutions is divided into three sections: wear improvements, flow improvements and noise reduction. Your choice principle will be based on processing conditions, material ,size, shape, drop height, volume, angle of impact,temperature etc. 5.1 Rubber Chute Liner : This is most common material as wear resistant lining,Which may be adhered in sheets or be vulcanized. It is better choice to absorbing noise during conveying materials, but not fit for small particle materials in wet working environment or materials with high temperature . 5.2 Hard Metal Lining of Chutes : Another wear protective linings used popularly . Which include Manganese steel, high chrome steel Chrome molybdenum steels etc. They are characterized by good impact resistance, high temperature resistance, corrosion & wear resistance and easily to be Cutted , bent or crimped, welded and punched.but it is also a heavy and costly choice . 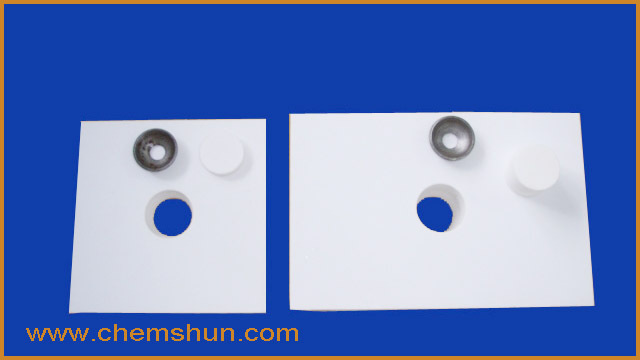 5.3 Alumina Ceramic Chute Liner : ceramic liner tiles have wide types for choice, like alumina ceramic plain tile , welding tile, rubber ceramic wear liner etc. Which kind of applied ceramic liner depends on different working environment including temperature, impact strength etc. 5.3.1 Alumina Plain Tile : it is installed by epoxy resin directly which provides a high shear strength and good resistance to chemical or moisture attack and ageing. 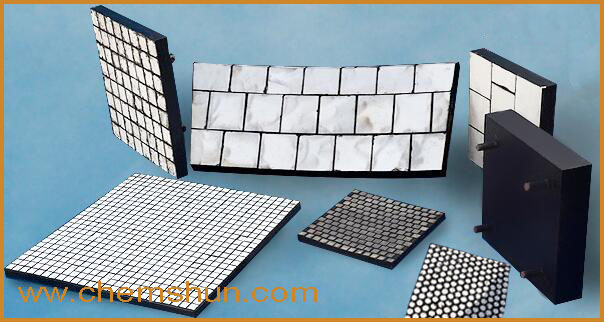 Standard sizes or ceramic cutting tiles can be supplied by China ceramic manufacturer like Chemshun Ceramics. 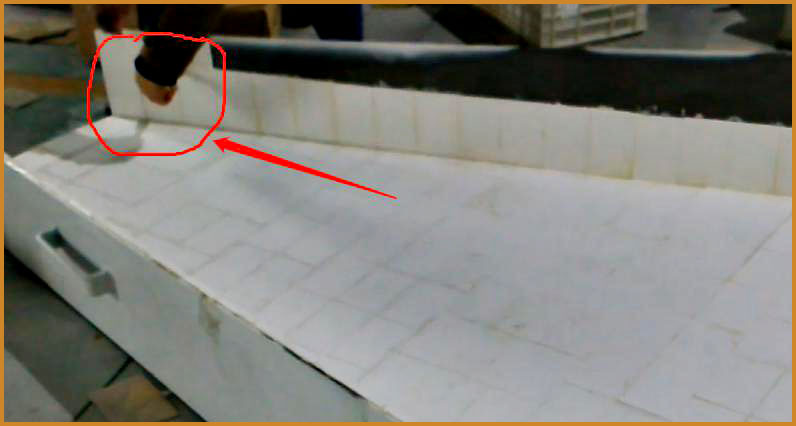 5.3.2 Ceramic Welding Tile : It provides excellent abrasion and impact resistance for industrial friction equipment. Is installed by epoxy resin and welding double ways. best wear resistant choice for dynamic operation equipment. 5.3.3 Rubber Backed Ceramic Wear Plate : a combination of wear resistant alumina ceramics vulcanized in resilient rubber sheet. Which has super wear resistance and impact resistance property from rubber and ceramics. Ceramic shapes can be vulcanized in current market mostly including ceramic cylinder, alumina hexagonal tile, square mosaic tile , ZTA ceramic tile etc .typical ceramic supplier factory like Chemshun Ceramics Company. Rubber ceramic wear liner is mainly installed by welding bolt. good choice as mining chute liner. Chute linings are subject to wear. Sooner or later the liner material will have to be replaced.different chute wear liner materials have different replacement & maintenance ways. Generally good access with enough room for maintenance man should be carefully considered when chute design.